All Singapore holiday posts. Click on pictures below to zoom. Our hotel booking didn’t include breakfast, and while I like a hotel buffet, we decided to look elsewhere for a morning feed. Being downtown, there should be plenty of options, and after some walking around we found a bakery in the Raffles Centre shopping mall nearby. Back in the hotel, I’d given up on finding a Singtel SIM, and decided to just cough up $70 for a Telstra “Travel Pass”, which would avoid the excessive ($3 per megabyte) roaming charges. It’s expensive, but the plus of this is not having to fiddle with my phone to swap the SIM over, and anybody texting or phoning from home could reach me on my usual number. The problem is it didn’t work. I could text or phone out, but nobody could reach me, and data wasn’t working. The Telstra Twitter bloke I reached was excellent in getting it investigated from their end, and making suggestions — made difficult by the fact that I could only talk to him while in the hotel on WiFi. Eventually we got it working. It turns out that buried deep in the Android settings a “Data Roaming” option was switched off, which was disabling data, but also counter-intuitively preventing inbound voice and text. Or… possibly… as the Telstra guy had suggested, it just took a couple of hours for the Travel Pass to activate properly. We had considered meeting my sister and her family and going with them to Gardens By The Bay, but at this point it was pouring down. Tropical heavy but warm rain. From that point on I vowed to carry my umbrella everywhere for the rest of the trip. Instead we decided to head for the National Museum Of Singapore. The rain was really belting down, and I’m sure the locals are used to it. At a zebra crossing I watched an umbrella being passed back and forth between people who apparently didn’t know each other. I wonder who donated it? We reached the Museum sodden but not cold. Like many big buildings, they had bags for wet umbrellas at the entrance, and happy to be inside again, we explored the exhibits. There was a big display of artefacts from the British Museum, which was very impressive. The items, from various times and places, were fascinating to look at. The only slight disappointment I had was that I saw nothing about the British Museum’s collections themselves; the controversy over some items being taken to Britain in the first place; the campaigns for them to be returned; and (somewhat amusingly) the merciless catalogue stamps that some precious items ended up having thanks to curators from centuries gone by. 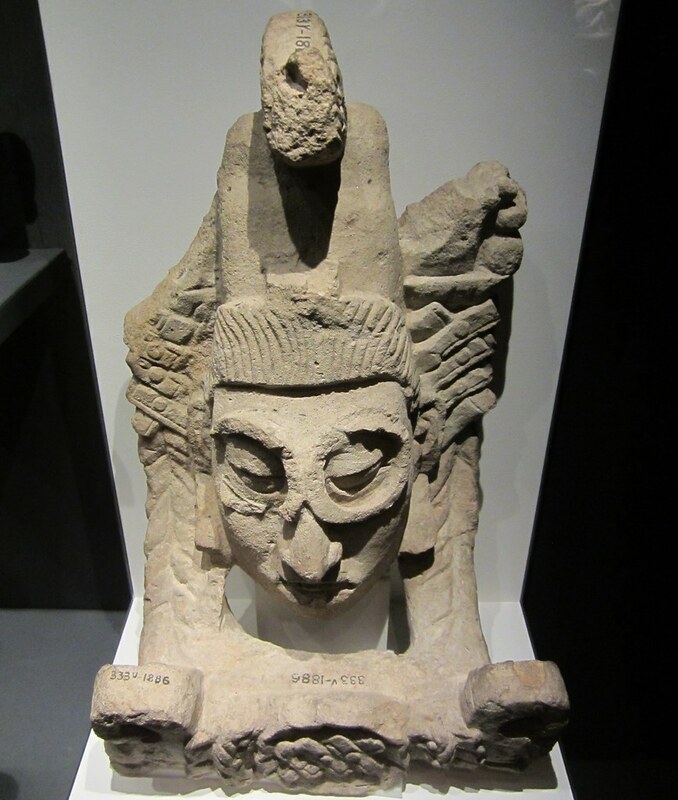 Portrait Head, from Honduras, circa AD 776. Apparently acquired in 1886. 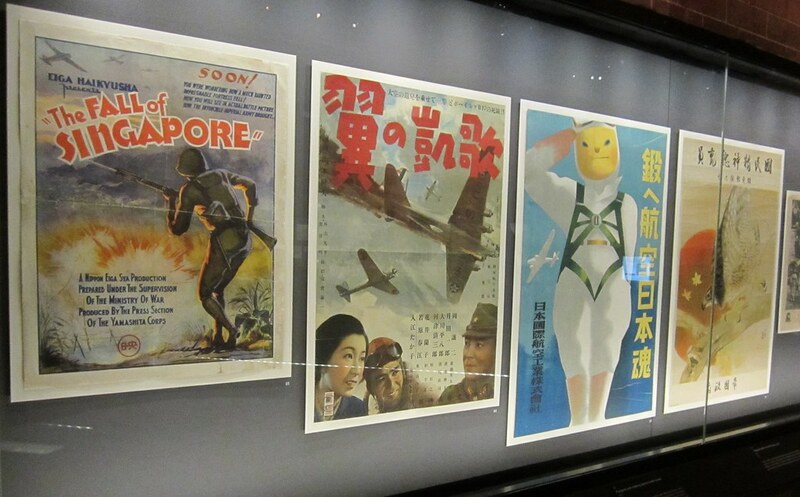 The Museum also had various other sections, including one on the development of Singapore, and another all about the WW2 occupation by Japanese, which I found quite moving. 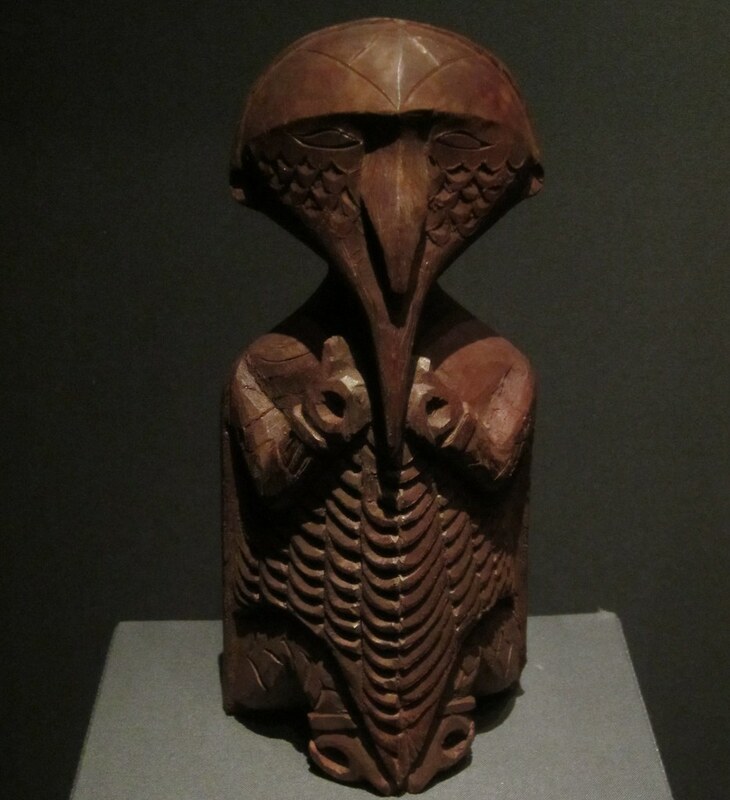 It sounds like the Japanese Military ruled the city with an iron fist, going so far as to behead resisters and display their heads as a warning to others. 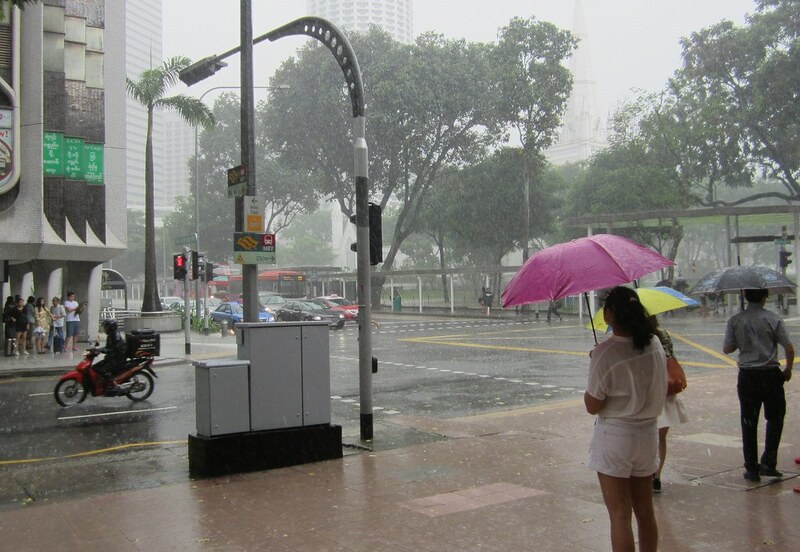 By this time the rain had stopped, and we met up with my sister and headed back to the hotel to change into our finest to attend High Tea at Raffles Hotel (just down the road). The dress code specifies that gentlemen must wear a collared shirt, and no shorts, no jeans. There were many many cakes. And much tea. And harp music. And superb atmosphere. 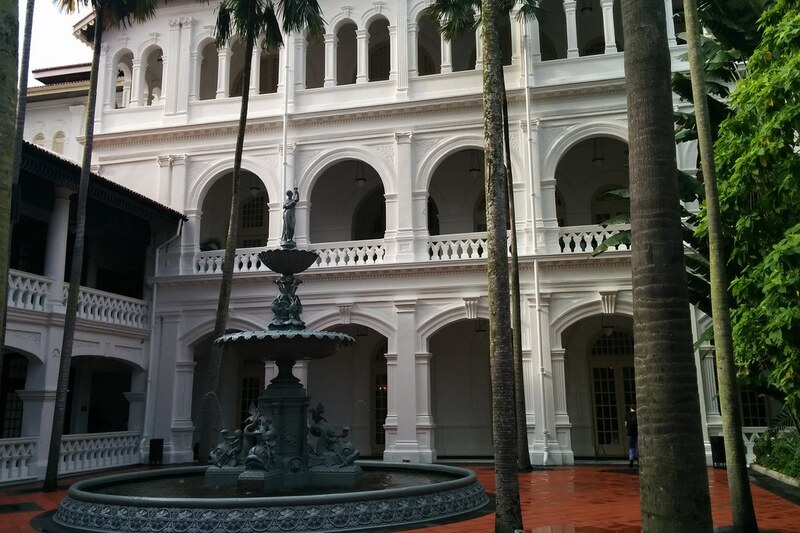 As a symbol of colonial splendour, you can’t beat it. It’s quite right that they prohibit jeans. Elastic waist pants might be more suitable — we didn’t need dinner. 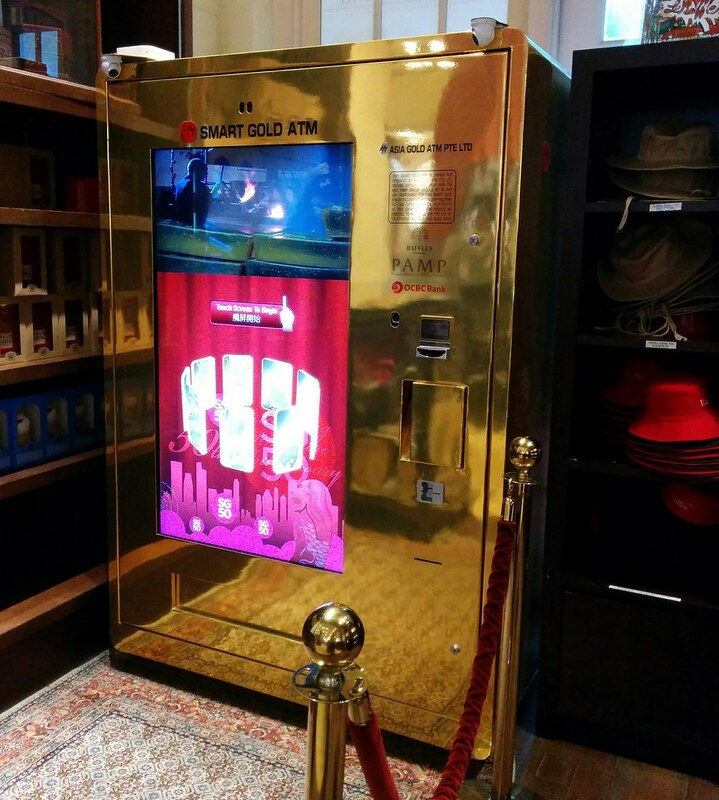 Something I haven’t seen before: a gold ATM, at Raffles. Back to the hotel to change into more practical hot weather clothing, we decided to walk it off by heading to Gardens by the Bay. 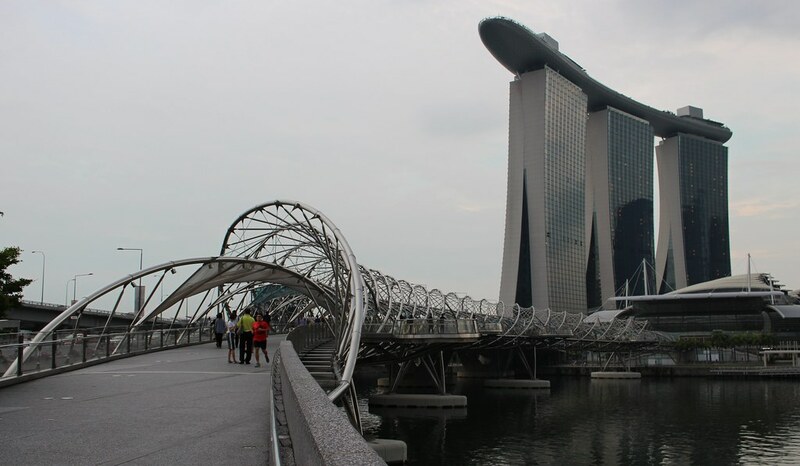 This took us down past playing fields, another grand hotel, the Fullerton, some kind of floating soccer pitch, and the helix bridge, a rather marvellous bridge shaped like… well, that would be giving it away. Across the bridge crowds of people were headed out, I believe from the big Communicasia conference which I knew was on, as I knew some people attending. 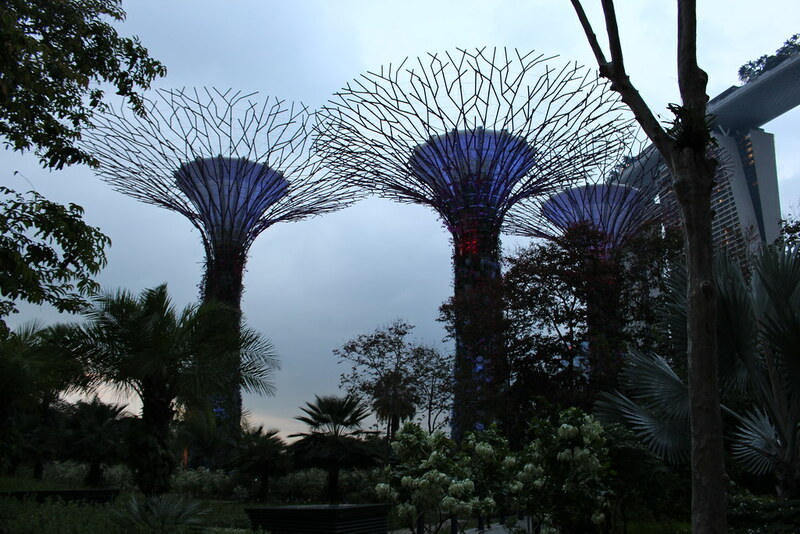 With dark clouds gathering and the threat of rain looming, we reached Gardens By The Bay. 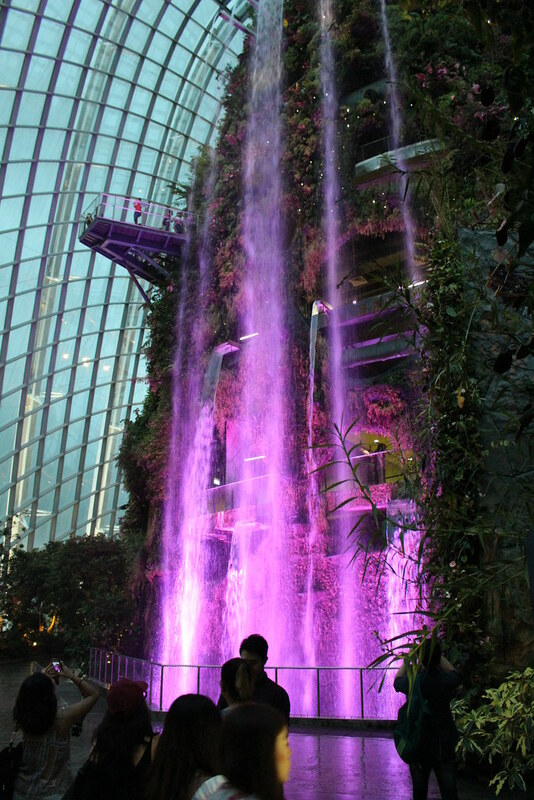 One attraction, the Skyway (an elevated walkway among the “super trees”) was closed, but we looked through the Cloud Forest (which includes elevated walkways) and the Flower Dome, which has themed collections of different flora. It was all very impressive, and well worth a look. 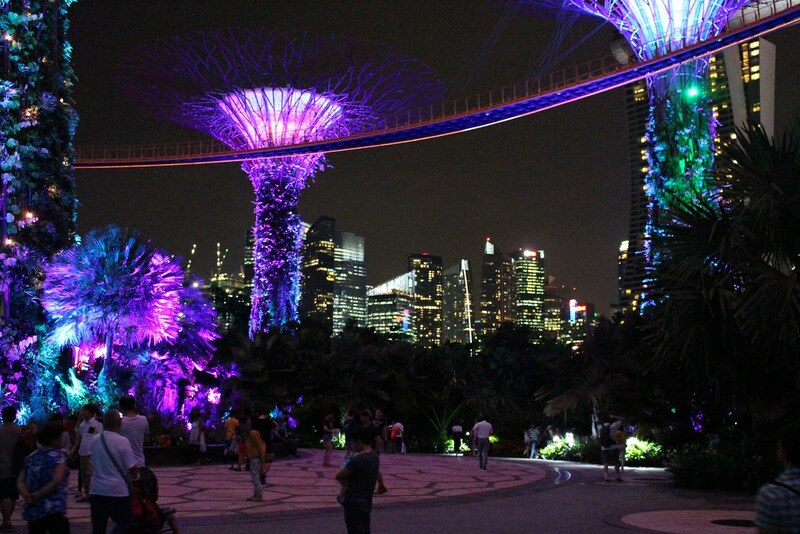 It was almost 8:45; in nearby Supertree Grove at 7:45 and 8:45 every night there’s a music and light show. Very well done; quite spectacular. The whole thing was great, and quite unlike anything I’ve seen in Australia; I’d recommend it. We decided to go back to the hotel via the MRT. 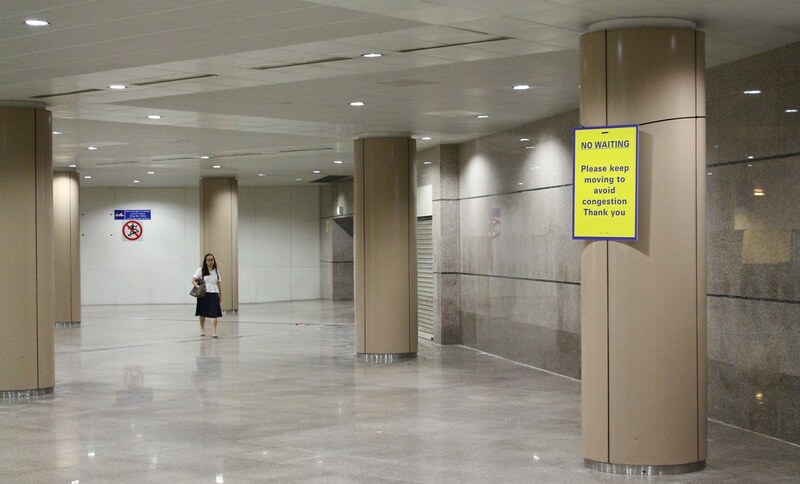 It was a fair walk to the nearest station, Bayfront (near the Marina Bay Sands) — a new line being built will include a station at Gardens By The Bay. Along the walk we took a wrong turn, and ended up going through the rather spectacular Marina Bay Sands hotel itself — which is basically three tall buildings with a mock cruise ship on top. 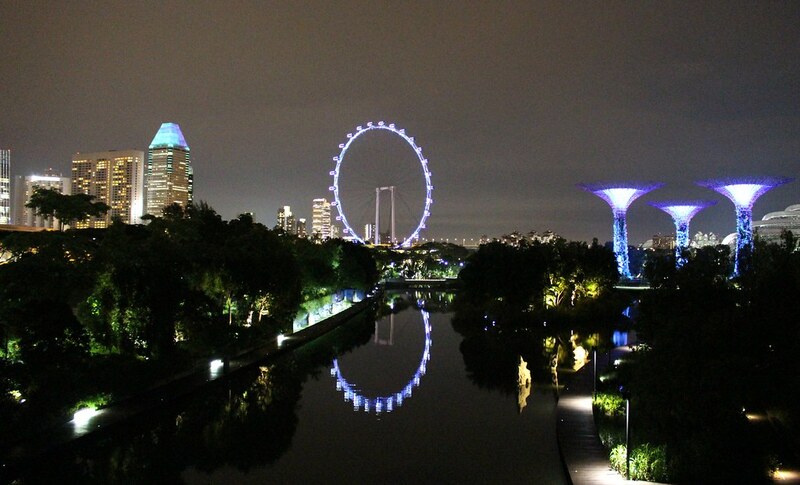 It’s visible from many spots around Singapore. 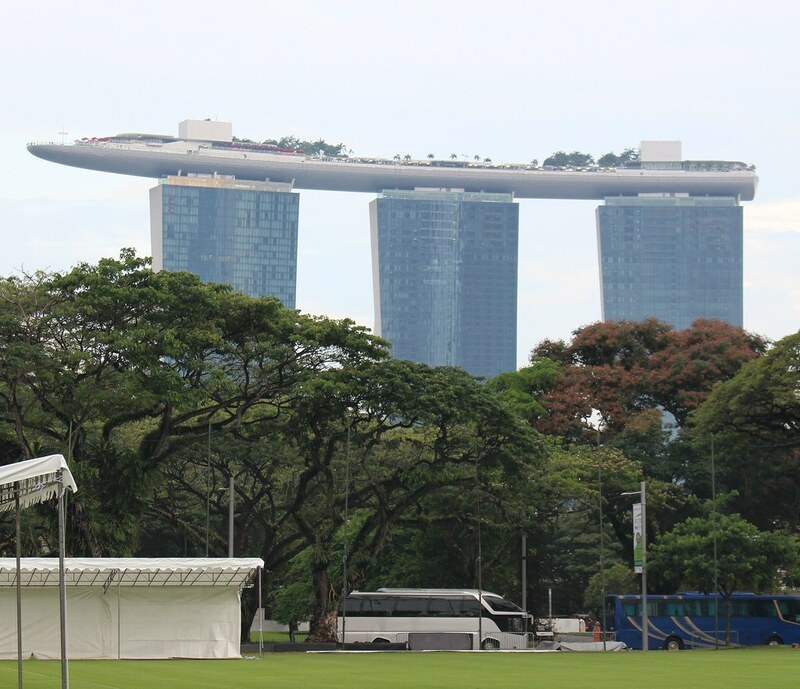 There’s a lot of eye catching modern architecture around Singapore, but this just has to be seen to be believed. 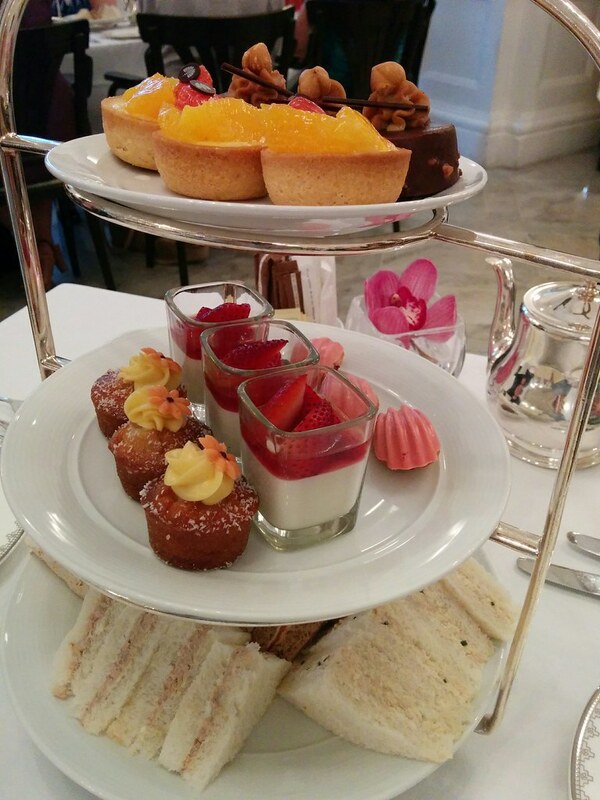 When we got back to the hotel, my phone was telling me we’d reached 21,000 steps for the day, so hopefully we’d earned that High Tea. Surprised to hear about your experience with getting a local SIM card. By experience it is easily found at the 7-Elevens or most telecommunication shops. Coming from there, the lack of a hotel breakfast is no loss to me, as there are plenty of cheap local food around. YMMV. 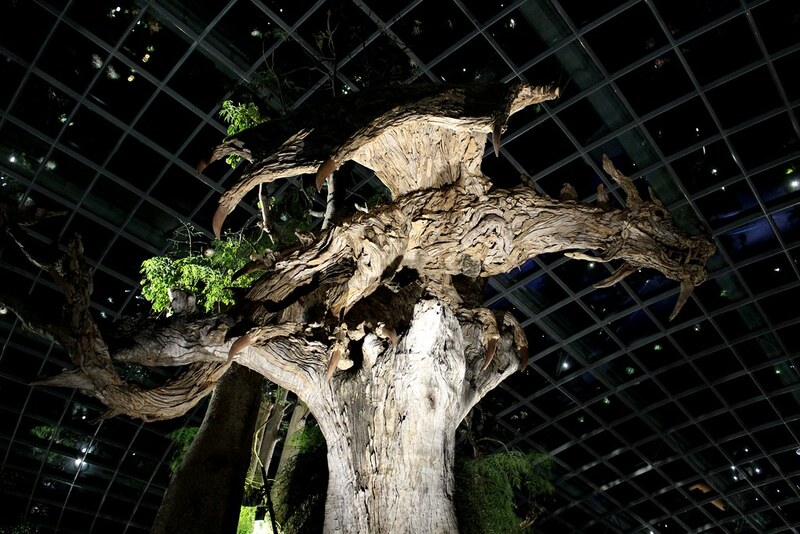 I can’t recommend Gardens by the Bay enough. Completely unrelated, but it seems our Premier has released a video about the Kororoit Creek Road grade separation in Williamstown North that seems to have confirmed that the bridge will hold duplicated tracks (as a passing loop?) and also hold a review for a passing loop at Seaholme station (will probably be built much later than any of the 50 level crossings). Hope to get more details at the information session tonight. Singapore sounds very exciting. I can’t believe the 3 tower buildng with a boat on top of it. Incredible. Have you had a Singapore sling yet? BTW, I’m, reading your blog while in France and the adverts on your site are now in French. Sacré bleu!